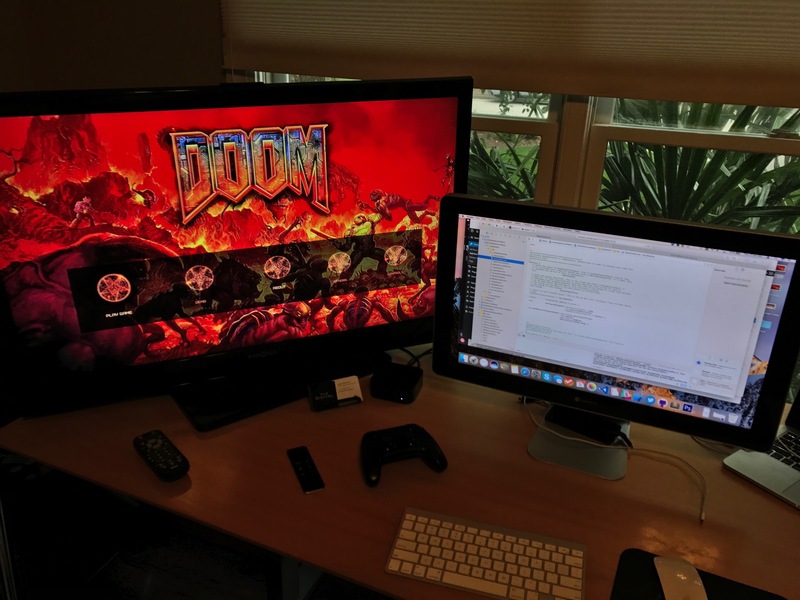 As I mentioned in my previous post, while a couple of people have got Doom running on tvOS, they either have not released source code, or did not have it running on more recent SDK’s and buildable in Xcode 8. I haven’t seen anyone implement game controller support either. I used a fork of John Carmack’s original code as a starting point. The code has not been updated in a while and did not support 64 bit architecture let alone the latest iOS / tvOS framework versions. I created the targets for tvOS and have been making several changes to allow it to run. The fork I used as a starting point expects the user to grab image assets and the WAD files from the paid version of iOS Doom. I don’t see a reason to use the image assets iD used from the paid version, so I am in the process of using assets that were not included by iD in the menus and so forth. That way, as long as someone has the WAD file from the paid version (I’ve bought it MANY, MANY times over the years) and a Mac they can sideload the project from Github in Xcode, add the WAD file and get it up and running pretty easily. It also allows me to use assets that are higher resolution for the menus. Currently, this is all gitignored so as not to violate licensing. While I do have it running, there are definitely some bugs. The menus need to be reworked for Apple TV, not all menu option are wired in yet, multiplayer is broken and there are some sound issues / crashes. The current code uses AudioToolbox which was deprecated a while ago and that piece needs to be rewritten to use AVAudioPlayer. I also need to get rid of some of the button overlays used for iOS since they are not needed. Once I get some of this cleaned up I will post the Github location and include better instructions. Please be patient, this is a part-time project and I am a busy guy. As you can see though, I am close. It is a blast to play on Apple TV with a controller! I am really hoping this will motivate iD to update Doom and release an official version of it in the App Store. I think the work would pay for itself because there is real interest to play it.